“People find ways to live with tragedy. But some people don’t. And maybe they deserve to get a movie about them, too.” That was how writer-director Kenneth Lonergan described the impetus for his devastating new film Manchester by the Sea to an emotionally wrecked Sundance audience at its world premiere on Saturday. But he quickly added that, as he worked on the film, it became slightly less despairing. “Hopeful” would be too strong a word, however. Like a baby yelling during a funeral, Manchester by the Sea is a vision of grief occasionally interrupted by the awkward vitality of life. It’s also a family melodrama that immerses you in a world of pain. And it reveals the source of that pain very carefully, first in fragments, then in a flood. 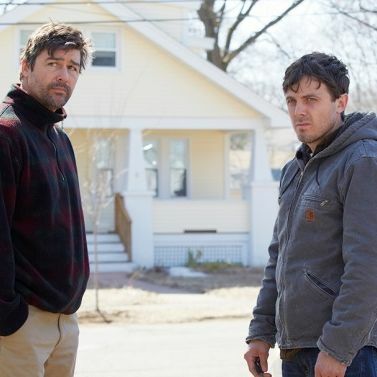 The first jolt comes early, as lonesome, hangdog Boston janitor Lee (Casey Affleck, perfect) gets a phone call informing him that his older brother Joe (Kyle Chandler) has dropped dead of a heart attack. Lee heads immediately to the fishing town of the title to take care of things. Highest on the list is what will happen to Joe’s son Patrick (Lucas Hedges), a high schooler who was very close to Lee as a young boy. Lee isn’t ready to take care of Patrick, and Patrick doesn’t want to go to the city with Lee; he’s too immersed in his life of girlfriends and rock bands and hockey and school to drop everything to go live with his janitor uncle in a shithole in Quincy. Staying in Manchester, however, doesn’t seem to be an option. As Lee drives and wanders around town, we become acutely aware that this place is poisonous for him. People whisper about him behind his back, in judgment and even a little fear. He himself barely speaks to anyone; when one of Patrick’s girlfriends’ moms invites him in, he just sits there, unable (or unwilling) to even make small talk. At every turn, the film gives us something that opens up a whole new world of possibilities. Lonergan is the master of taking a scene that starts off as something familiar, then sending it spinning off in another direction, and then pulling back at just the right moment, as the viewer’s imagination hurtles ahead to fill in the gaps. Slowly, Lee and Joe’s past comes through in flashbacks: We learn about the family Lee once had with the no-nonsense Randi (Michelle Williams, who doesn’t get many scenes, but proves why she might be the best actress of her generation in each scene she does get), and about Joe’s marriage to alcoholic, frustrated Elise (Gretchen Mol). These scenes provide new context to the present-day scenes: Lee might have smothered his soul with grief, but the people around him are managing, or at least trying, to move on — some out of necessity, some out of ignorance. To say more would be to tamper with the film’s almost unbearable build-up of emotions. But the writer-director has an eye for the telling human moment and a soul for the operatic. And as he proved in Margaret, he understands how landscape and setting can enhance the drama itself. In that film, Lonergan showed how the very public texture of life in New York affected our behavior. Here, the swelling waves and the snow and the bleating seagulls and the little islands dotting Cape Ann echo the characters’ lives — sometimes submerged and solitary, sometimes roaring with pain and anger and even joy. And while Manchester may proceed like a dirge, it’s also filled with surprising little reminders that life doesn’t, and can’t, stop. It could be something as simple as a teenager’s phone vibrating during a memorial service, or a casual conversation about Star Trek mere hours after a loved one’s sudden passing, or band practice that doesn’t stop for a death in the family, or even a malfunctioning stretcher during a moment of abject tragedy. It’s this combination – those unexpected minor jolts of life amid the major jolts of grief, along with the director’s visual poetry — that keeps Manchester by the Sea from becoming just another sad story. Its world is cruel and chaotic, but it unfolds with purpose and grace.